I know I say everything is my favorite, but seriously, mashed potatoes are my be all, end all. I just love, love, love them and have been known to eat mashed potatoes as a meal. Even when I was little I was obsessed with mashed potatoes. Other kids would talk about licking frosting or cake batter off a spoon; I would look forward to licking the masher when my mom made mashed potatoes. I’m not quite sure what it is about mashed potatoes that I love so much, but I think it’s definitely a texture thing. 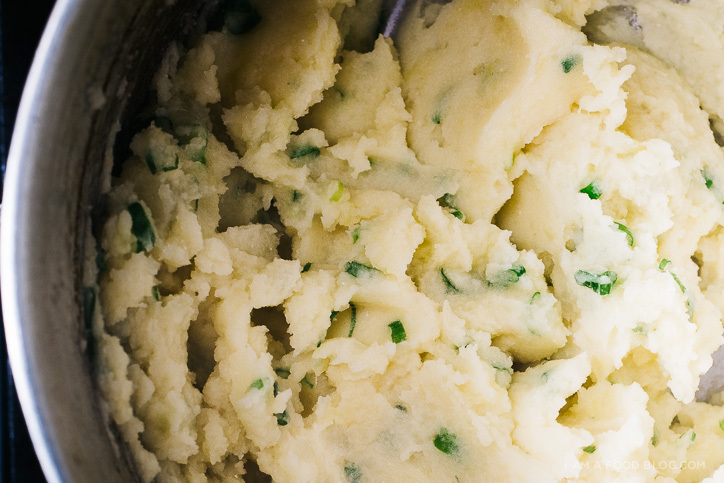 I’m way into super smooth potatoes, but I won’t say no to a chunky mash either – I’m generous like that, I love all kinds of mash. These potatoes here are simply smooth with a little texture created by sliced green onions. The miso adds an extra layer of umami and somehow it all combines together to taste a little bit cheesy without any cheese. Essentially, you don’t really need a recipe for these potatoes – feel free to play around with the proportions. Some people like their potatoes a little bit drier (less milk) and some people like them a bit more buttery. I used to be a purist about mashed potatoes, but now I’m totally open to different add-ins and variations. How do you guys like your mash? Put the peeled and chopped potatoes in a pot and cover with water. Bring the water to a boil over high heat then turn down to a simmer. Boil the potatoes until fork-tender, about 15-20 minutes. 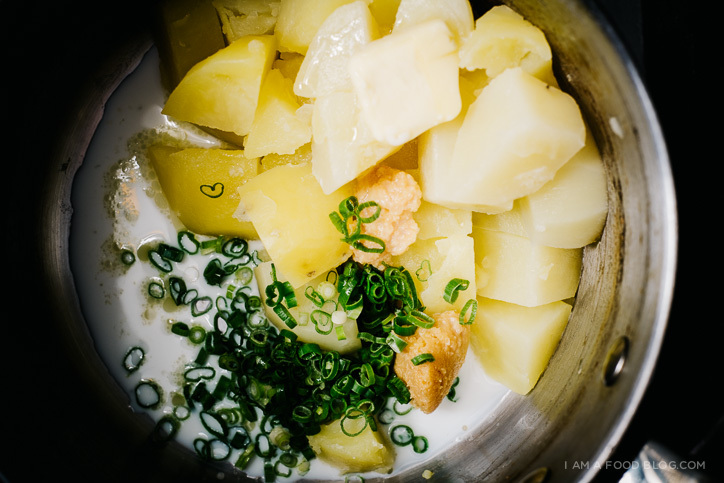 Drain the potatoes well and mash with the butter and miso paste. Stir in the milk and green onions, taste and season with salt and pepper, adding more butter and milk if needed. If desired, pop into a 400°F oven to toast the top until lightly brown, around 20 minutes. Enjoy hot. It’s an I am a Food Blog Thanksgiving! I made a tiny Thanksgiving for two featuring some Asian flavours. Check out my lemongrass braised turkey leg! Miso mashed potatoes sound unreal! Yum! Can I eat this with a ladle? It looks amazing! Love the miso addition here. 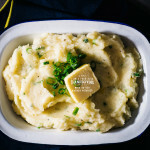 I’m normally a fan of a super garlic-y mash but this sounds like it has the potential to be my new fave! ugh. i LOVE roasted garlic mash. i think a miso roasted garlic mash may need to be in the works!!! I am with you, mashed potatoes alllll the way! That miso butter though, SWOON. That miso paste sounds insanely delicious in these! I’m a smoooooth mashed potato girl, but really, I’ll eat allthemashedpotatoes. a lady after my own heart. i totally love allthemashedpotatoes too. 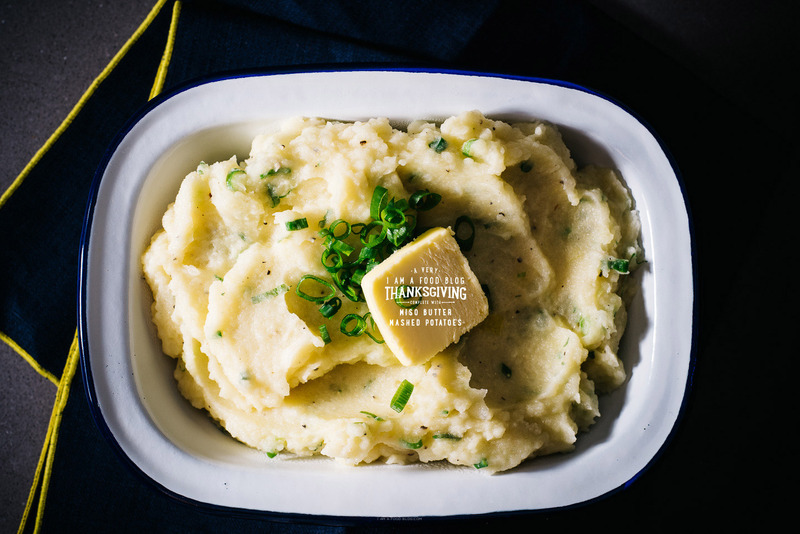 let’s have a mashed potato party, yes?! japanese potato salad is SO GOOD. i’m obsessed with it. I LIKE MY MASH LIKE THIS MASH. These mashed potatoes are my DREAM COME TRUE. I know I’m overdoing it with the caps but I just. can’t. help it. These are amazing. This sounds….. beyond delicious. Miso in mashed potatoes?! *face palm* A match made in heaven. I want to eat mashed potatoes always and forever. At least half of my plate on thanksgiving is dedicated solely to mashed potatoes….I use it like rice. With every bite I take, I take it with mashed potatoes. I can’t get enough of them. I love the idea of adding miso….these look absolutely delicious! I currently have yellow miso. If I use yellow miso, do you think I should less than a tablespoon? I haven’t tried with yellow miso – try it out with 1/2 tablespoon to start and then add to taste! Looks amazing!! I always eat all the mashed potatoes at Thanksgiving!! I am too much of a heavy duty mashed potato eater. Not a good thing at Thanksgiving when there are so many wonderful things to eat. Unique take on them. I like it. GAHHH THIS LOOKS VERY DELICIOUS ! I am all about miso butter anything. Miso butter mashed potatoes though?! Bravo. 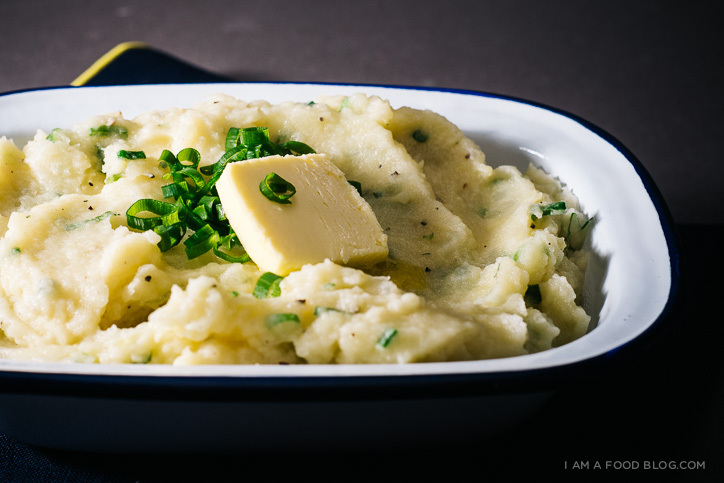 You just may have created my new favorite mashed potato recipe. If I wanted to make this without milk and do not have miso paste but I do have instant miso soup powder…Could I perhaps Make a water mixture and add this in instead of milk? Milk isnt something I usually buy, we always have almond milk but I dont think that would be great in mashers..
i think that might work, let me know if you give it a try. how do you normally make your mashed potatoes? just sub in the miso soup for the usual liquid amount you use. it won’t have as much miso oomph, but it’ll still be good!